REGINA - The Saskatchewan Roughriders held Day 1 of their practice week on Thursday, in temperatures barely above the freezing mark. Head Coach & GM Chris Jones said his troops enjoyed bundling up, and embraced the chilly conditions with a spirited workout. "It's kinda like anything else," Jones remarked. "It's like the first time you put on the pads, or the first time that you do anything different. When it's a little bit cold, they're going to be a little bit jovial. But tomorrow, it won't be as jovial as it was today." It was the first time we've seen the Roughriders since Sunday's 34-29 win at Montreal, a game which was Zach Collaros's finest as a Rider. The quarterback threw for 394 yards and engineered four touchdown drives. "We were just able to stay on the field," Collaros explained Thursday. "When you can sustain drives you run more plays, get more yards and score more touchdowns. I thought as a unit we played really well but there's still a lot to build off of. There's a lot of teaching on the tape. We've gotta get better this week. We play a really good team in Edmonton." Indeed, the Roughriders (9-5) host the Edmonton Eskimos (7-7) on Thanksgiving Monday at 2:00 pm. 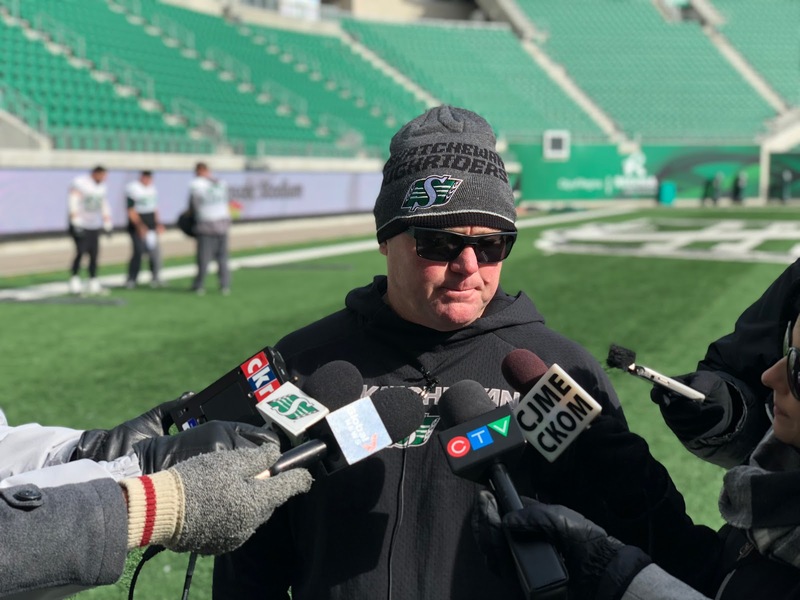 While a win won't clinch homefield in the playoffs for Saskatchewan, Jones said that's the goal they're working towards. "It's one of the big things in all of professional sports - and really in high school and college sports as well - is the ability to play in your own building," Jones offered. "We've been pretty good on the road - in fact we've dropped some games at home that we shouldn't have - so again we've gotta get back to playing really good football here at the house." The Eskimos are coming off a 30-3 shellacking at home by the Winnipeg Blue Bombers on Saturday, and Jones feels Eskimos QB Mike Reilly is going to come in with something to prove. "I can tell you this: he's a tough player," Jones concluded. "He's had a couple of tough weeks in a row. You're never gonna get him to drop his head. He's gonna walk into the stadium with his eyes up, and we've got our hands full."